Is It OK to Use T8 LED Tubes to Replace the Old T10/T12 Tubes? The T8, T10 and T12 tubes are mainly difference in the diameter of the tube. The main difference is in size…the T8 is one inch in diameter and everything else is divisible by that number: T5 = 5/8 inch, T6 = 6/8 inch, T8 = 1 inch, T10 = 1.25 inches (10/8), T12 = 1.5 inches in diameter (12/8). They are available in same lengths and same base types. Usually the old T10 and T12 tubes, are comes in 8ft with Fa8 or R17d base, instead of G13 bi-pin base. Now the LED Tubes T8 are available for all those base and 8ft, and also 2ft, 3ft, 4ft, 5ft, 8ft too. So it's quite convenient to use a T8 LED Tube to replace the old T10 and T12 tubes. While the size is the main difference there are other differences that are worth mentioning. 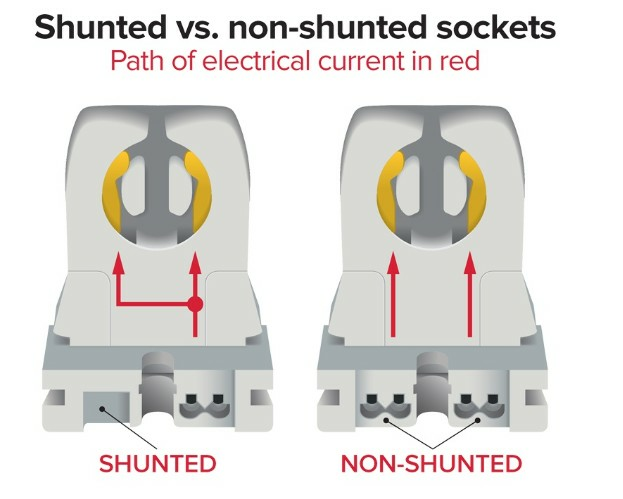 but, in general, the older the fixture, the more likely it is to have a magnetic ballast. You can purchase the ballast-compatible LED Tubes if do not want to make any change in your old tube fixtures. Or to save cost, to buy the ballast by-pass LED Tubes, which will need to change wire in the tube fixture to by-pass the wire to the old ballast. One more point need to emphasize. The T12 old tubes, the T12 sockets of the "Non-Shunted Rapid Start" type, which require the tubes to be single-end power feed type. There are single-end power feed and dual-end power feed tube, most of the LED T8 tube are default to be dual-end power feed type. So when you use the T8 to replace the T12, please double-check about the power feed types of your old tubes.